House, 4 Bedrooms, 4.5 bathrooms + Convertible bed(s) 2 sleeper sofas. The Aloha House is a spacious, well-appointed, four bedrooms, 4.5 bathrooms home with three separate decks located on the Northern Shore of Kauai, in the pristine Princeville Resort Community. Walk to 4 different beaches in Princeville, Puo Poa, Hideaways, Queen Emmas Bath and Sealodge beach. The North Shore of Kauai is set apart from any other place on earth with more magnificent scenery per mile then any place, the majestical deep green mountains and crystal blue water. From the Lanai one can see beautiful waterfalls on Namolokama Mountain also from the second floor wrap-around lanai you will see breath taking Hanalei Bay and marvelous sunsets over the Bali Hai skyline. Four master suites each with a private bath; top story is a spacious Master Suite with wet bar/kitchenette, marble bathroom, granite counter top, the shower has dual shower heads, teak table and chairs to enjoy your morning coffee and secluded lanai that has teak bar tables and teak bar stools to enjoy the gorgeous views of the famous Hanalei Bay. From the house one can walk to the beach -Pu'u Poa, or it is a short 2 - 10 minute drive to numerous diverse and beautiful beaches. Tastefully decorated with contemporary furniture and beautiful artwork displaying the Garden Island. Large and secluded tropical backyard deck with teak table and chairs and two teak lounge chairs and eight-person hot tub with mood lights and CD player and Webber Grill. Secluded outdoor shower. For your outdoor enjoyment we've provided boogie boards, snorkel masks and fins, beach chairs, coolers, beach towels and two mountain bikes. Walking distance to Princeville Makai Golf Course and five minute drive to the Prince Golf Course ranked #1 by golf digest. For your entertainment at the end of your day we've provided a library of over 1000 DVDs , music CDs, paperback books, Nintendo, X Box and games. We have been bringing our children to Kauai since they were three months old. We have equipped the Aloha House for adults and little ones. I have been traveling to Hawaii since 1983 and visited Kauai in 1996 and fell in love with the island. 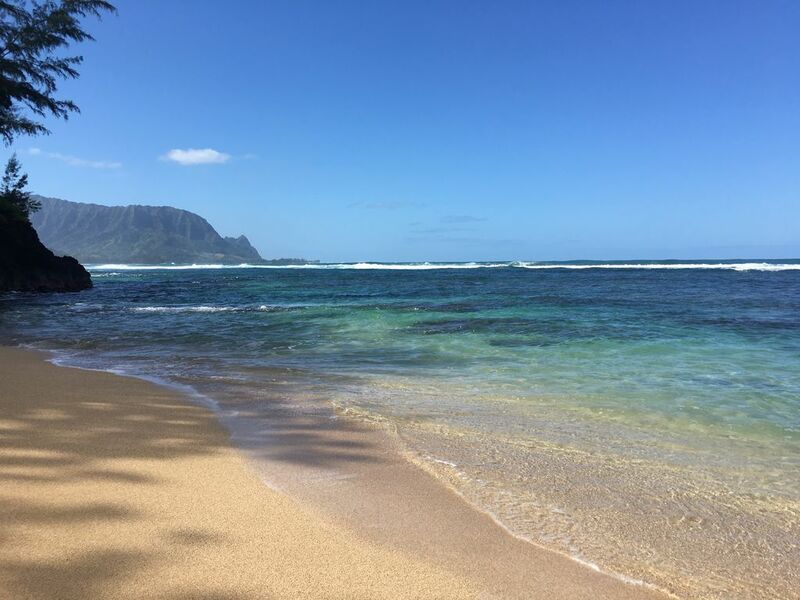 The North Shore of Kauai has everything- waterfalls, beautiful beaches majestic mountains, amazing views, great snorkeling, kayaking, beautiful lush tropical plants. Princeville Resort community keeps everything pristine and were always excited to return to our home. We plan to move to Kauai someday and treat our property as a home always making upgrades for our guests and ourselves to be someday our home that we never leave. The Aloha House is unique because every bedroom has it's own private full bathroom. There are 3 lanais, private 8 person hot tub and numerous amenities for guests to use. Each bedroom has it’s own private full bathroom and television. There are 3 Lanais. Families can spend time together or have their own private retreat. The house is equipped for little ones from a full size crib to a jogging stroller and much more. There are over 1000 DVD movies, Netflix and cable. The online agent lives across the street. A complimentary late check out will be given to all reservations if the schedule allows it. One is able to walk to Puo Poa, Hideaway beach and Queen Emmas bath all places that are a must when on the North Shore of Kauai. 4 parking spots in the driveaway. Towels provided for the house and beach towels provided for the beach. Spices, coffee, tea and dry pastas. Kitchen has everything to cook with. Professional juicer, roasting pans, rice cooker, frying pans, pots, spices etc. Living room and each bedroom have their own television. Total of 5 televisions. Toys for little ones for the house and the beach. Upstairs Lanai with views of Hanalei Bay. Boogie Boards, Snorkel Equipment, Beach toys, Beach Chairs. Easy walk or 2 minute drive to the golf course. 8 person secluded hot tub on the back lanai. There are numerous beaches within a few minute drive from the house or one can walk to the beach from the house, Walking distance to the Princeville Makai Golf Courses, and 5 minute drive to the Prince Golf Course, The Princeville Resort Spa is a few minutes drive with extensive spa services, There are miles of hiking and biking trails, There are so many activities one may engage in such as, Zip Lining, and Shelling. 43 white-sand beaches. Hundred of waterfalls, supersize flora and Hawai'i's only navigable rivers.